Doolphy, the European project management app, has just left beta with an attractive list of features, including unlimited users (even in the free version) and Gantt charts. I thought I’d sign up and check it out, but ended up frustrated by its poor internationalization. If you’ve used any other PM apps, Doolphy will seem familiar — you can use it to define projects, add tasks to those projects, assign users to tasks, charge time to projects and generate reports. Unfortunately, it seems the app has left its beta a little early. While things mostly seem to work OK, the app was originally written in Spanish, and the translation to English hasn’t been done very well (and in some places, it hasn’t been translated at all), which doesn’t exactly make it easy to use. While I was able navigate around the app and could set up projects and tasks, I have a smattering of Spanish and experience with similar online project management tools. 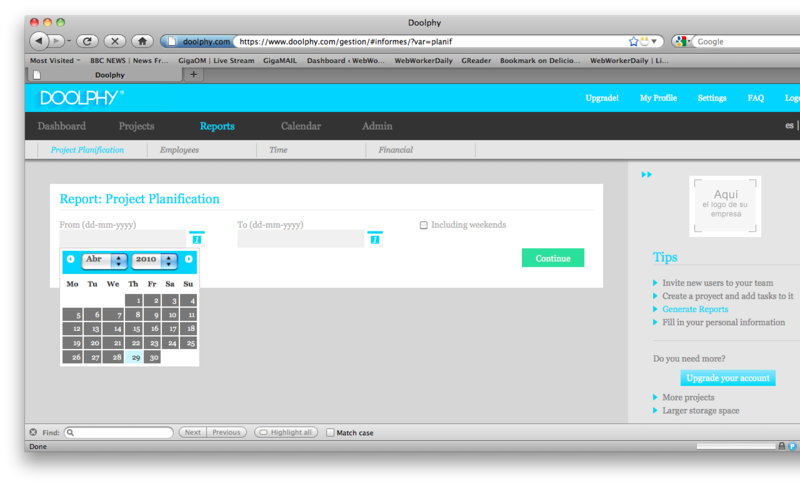 I think Doolphy would be too bewildering for non-technical, non-Spanish speaking users, and I can’t imagine being able to get a team using it — which, like most PM tools, is what Doolphy is really designed for. Additionally, even though the app is supposedly now fully launched, there’s not much in the way of help documentation. The Spanish version of Doolphy may be a useful app (the free version allows unlimited users, one project and limited storage is available if you’d like to try it), but as I don’t speak Spanish well enough, I haven’t tried it. And until Doolphy improves its internationalization, I really can’t recommend the English version against the many high-quality, established PM tools already on the market like 5pm, Wrike and Basecamp. Note to developers: Beta testing shouldn’t only be used to iron out bugs in your software, it’s also the time to make sure that any internationalization of your tools has been carried out perfectly, and that your documentation is adequate. If you speak Spanish and have tried Doolphy, let us know what you think of it in the comments. Hello everyone, I’m italian guy, my english level is far away to be perfect, but i think the english text in Doolphy is not bad. I think that is an international english without slang, useful for iternational people in order to use the Web as soon as possible! I’m so happy with the tool, keep improving!! 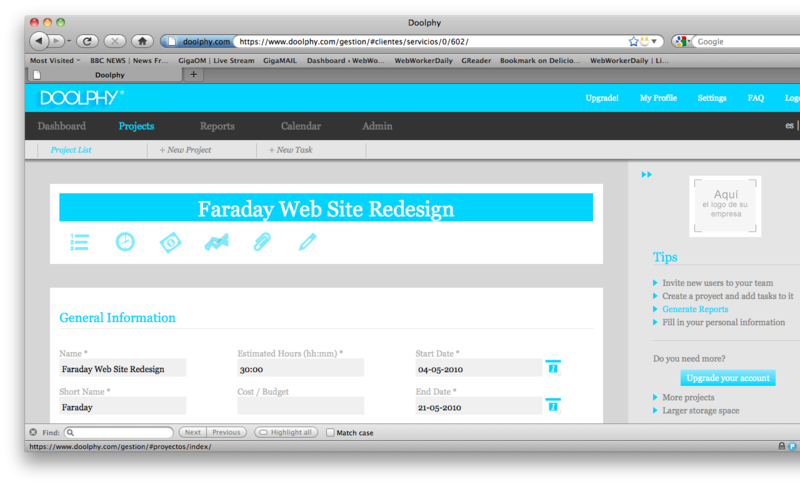 Thank you very much for paying attention to Doolphy among all on-line project management applications. We really appreciate your review, which complements the feedback we have received from our users. As you mention, Doolphy recently left the beta coinciding with the release of a file manager that improves the collaborative use of the application. First of all, we want to apologize to you all for the errors you may have encountered in Doolphy. We are working hard to correct them and improve the usability of the application as a previous step before adding new features. Regarding the English translation of the application, it is true that we still have issues to solve. We’re aware of the critical importance of a correct language use in our internationalization strategy. In fact, we’re in process of editing all the text content of the application in both English and Spanish. As well, during the beta phase, our users have told us about the necessity of having more help within the application to make it easier to use. Currently, we’re writing a set of tutorials that will be available in the next weeks. In the meanwhile, we have set a technical support service via e-mail which users can use to obtain answers to all their questions and requests. We have also added a FAQ section in which some of the application concepts are explained. I worked in Spain for many years and this app looks like it was translated into English by a native Spanish speaker. Professional translators always translate into their native language and I don’t think that was the case here. The other piece of QA that is missing is editing by another English speaking translator, which is SOP for translation companies. It’s mind boggling that they plan to launch their product with this poor translation. It makes you question the quality of the app itself.